In conjunction with Carol and Ruth at Country Park I designed Blends to assist their clients. Initially we looked at common issues and worked on that idea. But using herbs for good health can be quite limited if one becomes fixated on ‘disease’ so the concept was expanded upon and the idea to help you as horse owners get more in touch with the seasonal needs of your horse and in harmony with nature fitted more with the philosophy of going with the flow and taking the path of least resistance so you could gain the maximum benefit from herbs with the least amount of effort. Following the flow of nature is not a new concept. Many streams of medicine and cultures follow a seasonal healing cycle, from the Amerindians to the Ayurvedic practices of the Indian continent and the Taoism of Asia, even primitive tribes in Africa adhere to the flow of seasons. My traditional herbal training is grateful to the ideas of Culpeper and the like who can then be traced back to the “humours” of Hippocrates that were guided by the seasons to help achieve better health. All living organisms are composites of rhythm, the cycle of heartbeats vary in speed in the morning to that of the evening; the cycle of electrical activity of the brain can occur in nanoseconds; breathing is rhythmic and follows a cycle that keeps us all alive, and many hormones are released in pulses that flow with many cycles. Even diseases have a cycle and rhythm to them while other biological activities are synchronised with the cycles of the moon and sun and governed by the earth’s rotation. Annual seasonal rhythms are more noticeable in animals. It is easier to get your horse to concentrate in winter but at the same time, resistance to infection is lower. 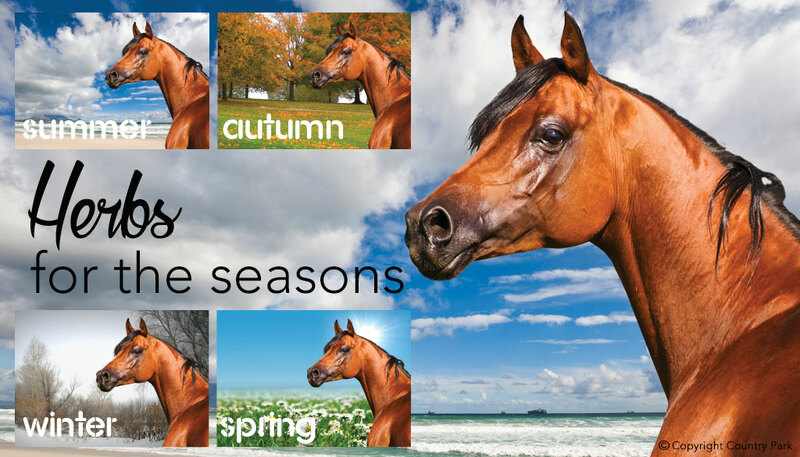 Sometimes the body is a bit out of step with all the changes from one season to another, and this is why the Winter, Spring, Summer, and Autumn Blends are of so much value to the horse owner. In Winter herbs such as Nettle are needed to maintain physical strength; the body often becomes congested with phlegm which inhibits its ability to flow naturally and needs the support of herbs such as Clivers, Dandelion Leaf and Yarrow to help the body. In Spring with this phlegm dissolving, the body’s digestive system can be put under extra strain so plenty of exercise assisted with the herbs included in the Spring Blend such as Fennel, Rosehips and Yarrow keep your horse in tune with nature. Once the heat of Summer arrives, the body may again be robbed of some of its strength and become lethargic. Cooling herbs such as Marshmallow Root and Calendula assist the body with the extra strain it is under and also strengthen the skin to meet the conditions. Finally as Autumn comes upon us, dampness can predominate and weaken digestion again, and the Blend we designed for this season with herbs such as Peppermint to assist digestion and Echinacea to prepare the body for the next season come into their own in assisting your horse. Thus keeping our horses in tune with Nature. In Winter the kidneys are your organ of elimination so the Winter Blend incorporates Dandelion Leaf to fit with this regimen. In Spring the primary organ of elimination is the liver, so the Spring Blend incorporates the use of herb Vervain. 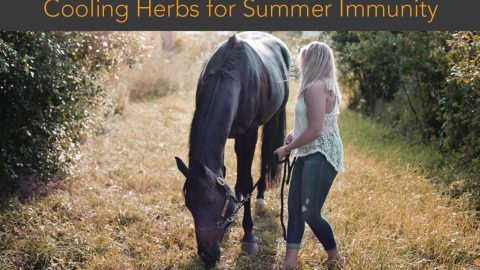 In Autumn the herbs Licorice Root and Parsley come to your horse’s aid with the elimination that is primary within the intestines at this time. To complete the selection of herbs for each season we have included wonderful tonic herbs in each Blend to further maintain the ideal balance within your horse’s body. The totality of each seasonal Blend is so special, you do not need to give more than one Blend to your horse at any one time. As you can see much thought has gone into caring for the health of your horse along with observances of the cycles of nature and its effects on the body. Being in harmony with the seasons affords you and your horse much more enjoyment with good health and mental wellbeing. Copyright: Catherine Bird, who is also the author of a Healthy Horse the Natural Way, has been an equine natural therapist for 27years working closely with Country Park Animal Herbs for over 13 years offering advice to their clients.